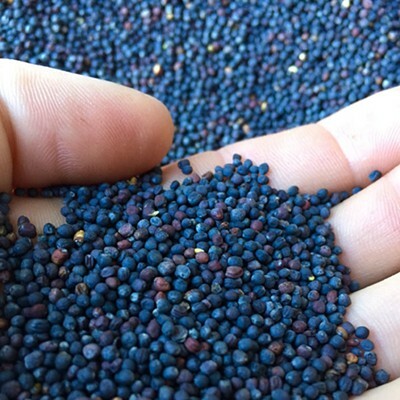 PHOTO COURTESY LISA BARKER Organic Dwarf Blue Vates Kale at Fruition Seeds, the Naples-based organic seed packet company that specializes in seeds adapted for the northeast states. 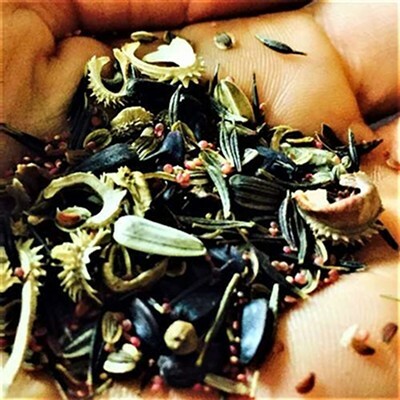 Store is open each Saturday through June 3, from 10 a.m. to 2 p.m.
Petra Page-Mann, co-owner of the organic seed packet company Fruition Seeds, has saved seeds since she was a child, working alongside her father in his garden in Naples. Saving seeds "was just something we did every year, and I didn't think much of it," she says. Almost two decades later, she realized it was not only an unusual and fortunate life experience, but that her love of agriculture had blossomed. 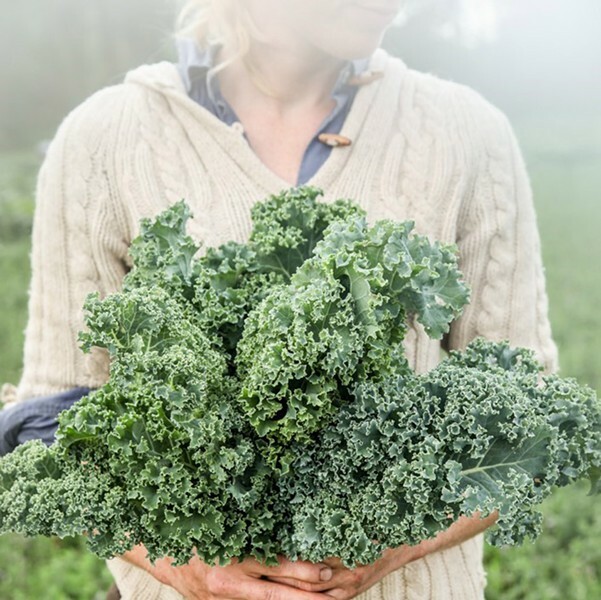 "This love really stems from my love of food," she says, "growing food and sharing food with people I love." 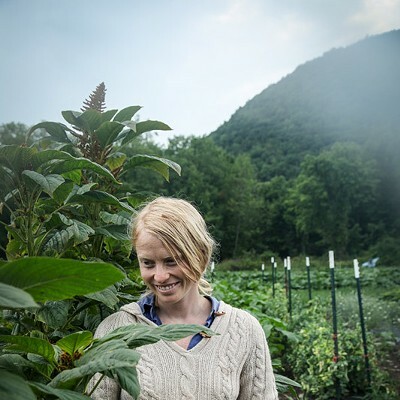 Page-Mann and her partner, Matthew Goldfarb, founded Fruition Seeds, based in Naples, in 2012. The company offers organic heirloom and new hybrid seeds specifically adapted for the northeast states. Before, Page-Mann and Goldfarb had each been small-scale organic growers who were unaware that the seeds they used didn't line up with their values. 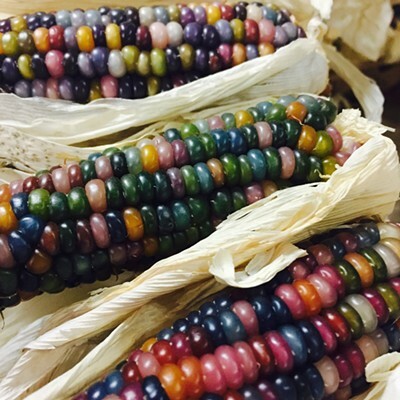 "I took for granted that seeds arrived in the mail, you plant them, and call it local food," Page-Mann says. 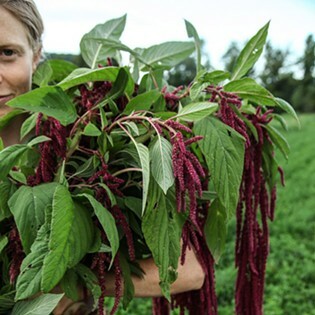 "I didn't have any idea, until I started asking deeper questions about the food system, how deeply disconnected the world of seed is from agriculture and specifically organic, local agriculture. It's actually this massive, multi-national kick-down; there are two companies that own 70 percent of the seeds that are sold on the planet." And while there are hundreds of different packet seed companies to choose from, many function as little more than distributors for these big companies. Essentially, the world's seeds are adapted to thrive in areas similar to central California. "When you walk into a forest in the Finger Lakes, it's very different from a forest in Maine or Virginia or Oregon," Page-Mann says. "And each plant has attuned itself to its place to an incredible degree. But right now we're treating agriculture with a one-size-fits-all genetic approach." Page-Mann's interest centers on adapting genetic diversity to the short and increasingly less predictable growing seasons of the Northeastern region. 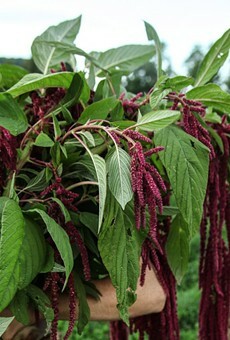 Fruition Seeds offers more than 350 varieties of vegetables, tomatoes, herbs, and flowers. The operation consists of four farms and a seed store, and employs five year-round employees. 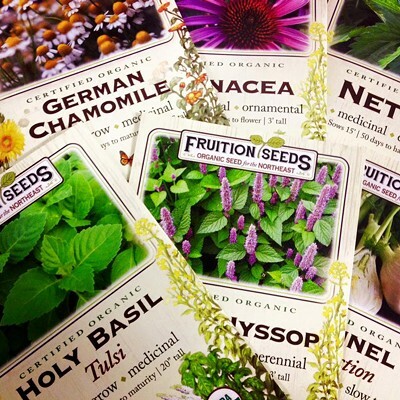 Customers can order seeds from Fruition's website, which is a downright celebration of our garden planet and features images of jewel-like spectrum of plants, mouth-watering descriptions, and tips on planting. 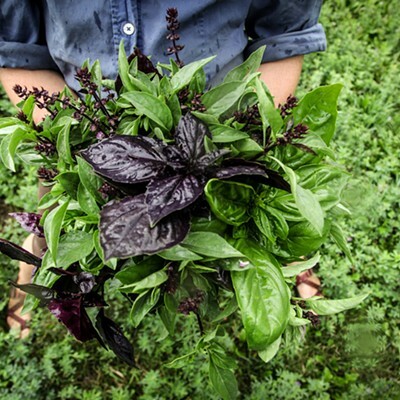 Fruition sells seeds predominantly to home gardeners, but also grows specific seeds for more than a dozen farmers and collaborates with chefs. 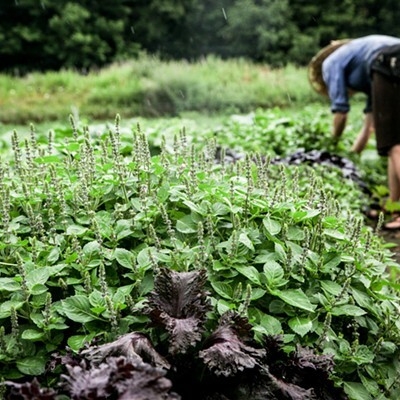 For example, Remembrance Farm in Trumansburg grows 30 acres of salad greens and offers several signature mixes. One of the mixes that contains edible flowers includes Calendula, which has a diversity in number of petals. "Because the farmers are individually plucking each of these flower heads, the more petals on each flower, the more efficient the work is," Page-Mann says. So Fruition developed a flower variety that has more than 100 petals per head. In the seed-saving business, food is the byproduct, so when Fruition found itself with 7,000 pounds of certified organic winter squash a few years ago, they connected with Foodlink, whose workers followed a protocol for harvesting the seeds and kept the food for their operation. "When farmers are no longer seed savers, it's like a fundamental part of democracy is missing," Page-Mann says. "It's like saying, 'Well, we really don't have to vote.' It's a tremendous right; to know and make choices." The practice of saving seeds goes deep into human history — about 10,000 years, Page-Mann says. And for the vast majority of that time, we had no idea what genetics were; it wasn't until about 60 years ago that we even understood what DNA was. So seed-saving was based off of the appearance and taste of the plants. For 2,000 years we were keen observers, she says, but today we aren't so adept at pattern recognition. The basic process of refining a variety involves "roguing" or killing the plants that are not demonstrating the desired qualities, thereby eliminating those traits from the genetic pool. "When I hear people say 'I love to garden, but I tend to kill plants,' I giggle to myself, because I kill tens of thousands of plants every year very intentionally," she says. This involves an understanding of phenotypical, or observable traits and unexpressed traits, and how they are linked. There are certain indicators Page-Mann has learned to identify, like the specific curl of a zucchini leaf that means the plant is susceptible to a kind of mildew. Because she knows these traits are linked, she'll rogue those plants early, before they start dying or passing their genes along. 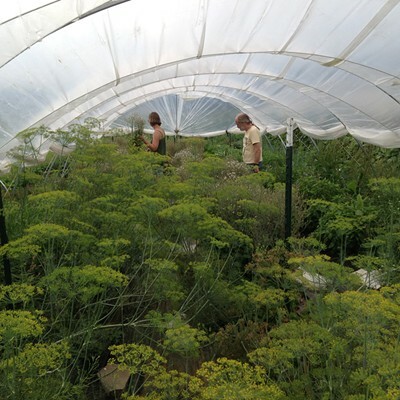 Fruition also develops new varieties of plants through hybridization, which involves taking two carefully selected, inbred parent lines and manually crossing them, and then securing them with airtight bags to keep airborne pollen and bees out. "By the time 50 years have passed, they'll be beloved heirlooms for our grandchildren," Page-Mann says. 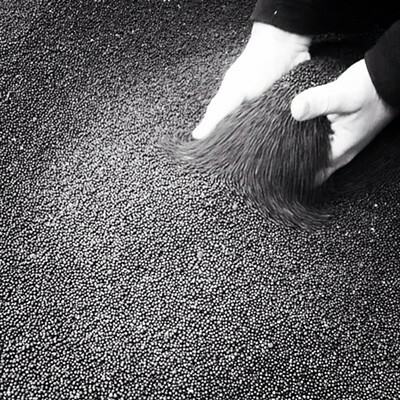 "We think of seeds as books. It's important that we have 500-year-old books and five-year-old books, but it's also important that we continue to write new books constantly."